Where’s the Fun in 2019? The WTF (Where’s The Fun) Map has been released for Blazing Swan 2019! This is where you’ll find your favourite and new theme camps at Jilakin Rock City. 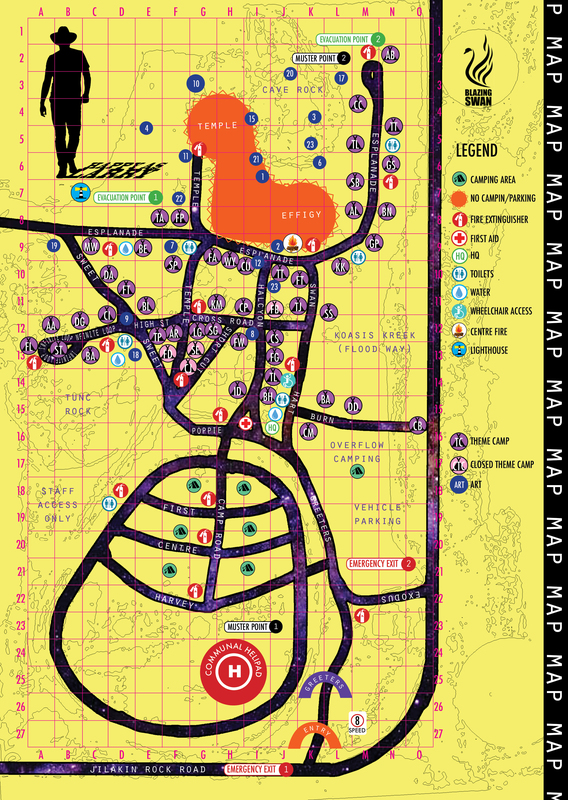 Everyone who attends Blazing Swan will receive a printed WTF guide at the gate, which includes a double-spread copy of this map. Please note that this map is a guide to where streets and theme camps are. There may or may not be giant robotic creatures roaming on Cave Rock; or cocktail-drinking, one-eyed ballerinas riding flame-throwing bananas on the Esplanade.You have been warned!